Though the 2018-19 season is nearing its halfway point, only three of the ten announced lift projects have been completed in New England. Killington's Snowdon Six Express debuted in December, while Magic's Green Chair and Stratton's Snow Bowl Express opened in January. 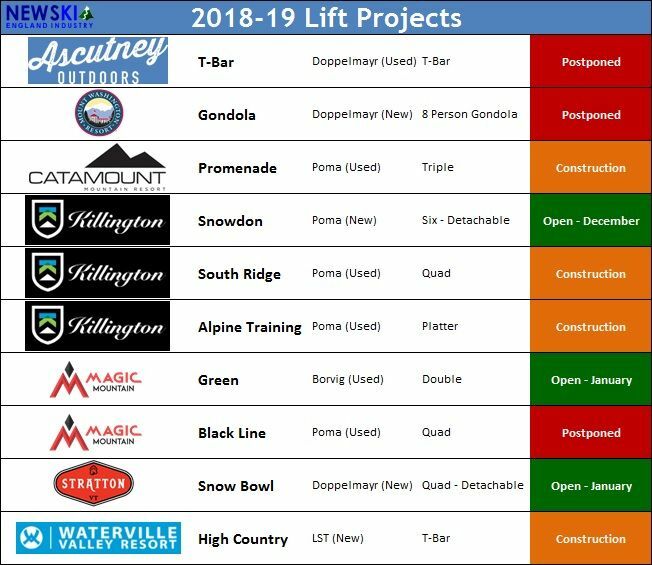 Thus far, three lifts have seen their anticipated openings postponed until the 2019-20 season. Due to state permitting delays, Ascutney and Magic were unable complete main lift projects. Ascutney did not receive a state permit until late September and was not able to complete construction of its T-Bar prior to the early snowfall. As a result, the non-profit ski area is only operating a rope tow. Meanwhile, Magic did not receive a state permit for its fixed grip quad until earlier this month, so it continues to use its Red Chair as its main lift. Bretton Woods had to delay the opening of its new gondola until after the ski season, as the early snowfall and issues procuring parts hampered construction. Four lifts remain under construction with the possibility of opening this season. Catamount continues to work on the Promenade Triple, with a February opening now eyed. The refurbished Poma brand lift will augment the Meadows Triple while also providing access to new terrain. Killington continues to work on the South Ridge Quad and Alpine Training Pomalift, both of which could start spinning in the next few weeks. Waterville Valley's High Country T-Bar is "in the process of the manufacturer's inspection" but is not expected to open until the Federal government shut down is resolved, as US Forest Service approval is needed.